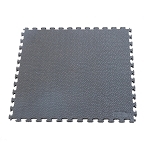 Norsk PVC tiles are a perfect fit for any garage, basement, gym, kids play room, and many other areas. All tiles are created with safety and durability in mind. 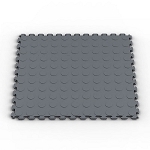 Whether you need a garage floor tile or a basement tile, Norsk™ multi-purpose flooring is easy to install and is extremely durable and resilient. Our multi-purpose interlocking tiles are resistant to most chemicals and solvents and provide excellent acoustic and thermal insulation. Unlike cheap rubber tiles with distasteful odors that shed rubber granules, our odorless proprietary raw material formulation provides excellent anti-fatigue characteristics. Interlocking tiles come packaged in a (6) pack box for a total of 13.95 sq. ft. Trim Kits are available in (4) colors and include (14) straight edges and (4) corners. We are confident that Norsk™ multi-purpose floors will exceed your expectations. The Norsk™ patented tooth design provides a much stronger interlocking mechanism than most tile designs, insuring robust connectivity under adverse conditions such as abrupt turning of car tires. 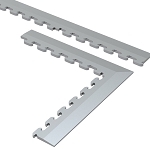 This unique tooth design features ease of installation and yet is durable enough to permit easy replacement of tiles and flexible enough to be portable for temporary install applications like tradeshows. Only Norsk™ interlocking floors feature our Patented Air-Dry™ design. The Norsk™ Air-Dry™ design permits airflow under the tiles, allowing moisture to easily evaporate or weep away. All Norsk™ flooring Trim Kits include this same feature, making it the most advanced PVC flooring product on the market. Norsk™ interlocking PVC floors are .250"/6.3mm thick, making them functionally much stronger for use under vehicles or equipment in garage or commercial applications. This premium thickness provides more surface area to work in combination with the NORSK™ patented tooth design, creating a robust yet durable interlocking feature not found with competitive products made from much thinner gauge materials and inferior tooth design.